Are Geauga Lake, SeaWorld, and Six Flags Ohio Open? For many years, folks in the Cleveland area were able to ride roller coasters and enjoy other amusements and attractions at a lovely lakeside setting. In the late 1900s, there were many changes as the attractions evolved. For awhile, there were exciting developments that held great promise. Then, all of the grand plans started unraveling. Today, all of the amusements are gone. What happened? 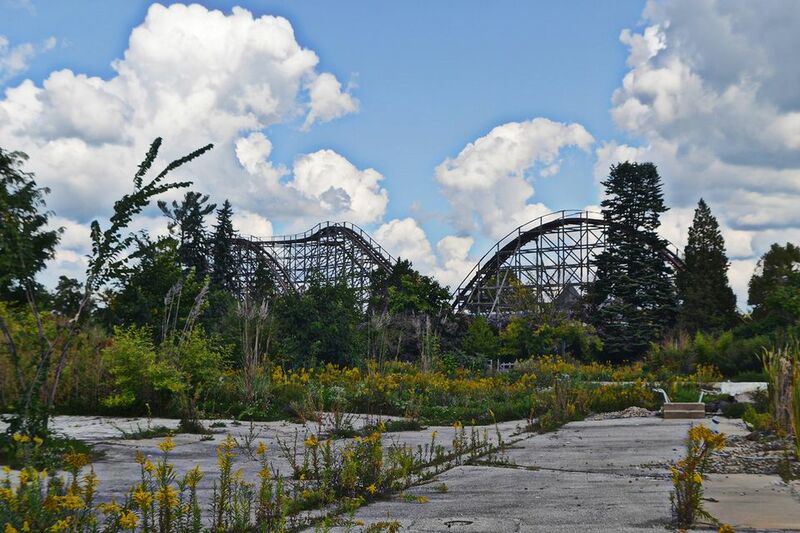 Let’s explore the coaster-like rise and fall of the Geauga Lake area. Located in Aurora, Ohio, Geauga Lake entertained generations of folks in the Midwest. It dated back to 1889. Like many turn-of-the-century lakeside parks and trolley parks, Geauga Lake added roller coasters and other amusements in the early 1900s and thrived for many years. One of its earliest attractions was the Big Dipper wooden coaster. Many similar older parks had a difficult time competing after the advent of the automobile and modern theme parks. But Geauga Lake hung in there and continued to thrive well into the latter part of the 20th century. Starting in the mid-1990s, however, it began a tumultuous phase that ultimately ended in its demise. A company called Premier Parks acquired the classic, independently owned amusement park in 1995. In 1998, Premier Parks purchased Six Flags and adopted the Six Flags name for its company. It changed Geauga Lake's name to Six Flags Ohio in 1999. In a bid to compete against two other formidable Ohio parks, King's Island and Cedar Point, Six Flags purchased the neighboring SeaWorld Ohio, which was located across the lake from the amusement park. In addition to SeaWorld Orlando, SeaWorld San Diego, and SeaWorld San Antonio, the Ohio park was the fourth location where visitors used to be able to see Shamu perform. Six Flags continued the marine life shows and exhibits (but dropped the SeaWorld branding and references to Shamu). In addition to acquiring SeaWorld, Six Flags built a water park. In 2001, it dropped the Six Flags Ohio name and called the combination of the three parks, "Six Flags World of Adventure." A single admission allowed entry into the marine life park, water park, and the amusement park. Whew! Are you still with us? We told you it was tumultuous. The mega-park never generated the numbers Six Flags had anticipated. At the time, Six Flags/Premier Parks, which had rapidly acquired parks both in the U.S. and abroad, had accumulated mounting debt and was a troubled company. In an attempt to reduce some of its debt, it sold the entire Ohio property to rival chain, Cedar Fair (owner of Cedar Point) in 2004. Cedar Fair closed the marine life exhibits and sold the animals, relocated the water park slides and attractions to the former SeaWorld site, and rebranded the park with its original name, Geauga Lake. After four disappointing seasons, Cedar Fair (which purchased Kings Island and the rest of Paramount Parks in 2006 and faced its own debt issues) announced that it would permanently close the amusement park in 2007. With the coasters and other dry amusement rides gone, Cedar Fair retired the Geauga Lake name in 2007. It continued operating the water park, however, and renamed it Wildwater Kingdom. The water park remained open through the end of the 2016 season. Cedar Fair put the final nail in the coffin of the property by announcing that the 2016 season would be the last one for Wildwater Kingdom. The water park was all that remained of the once-thriving amusement area. There are no longer any amusements at the property.